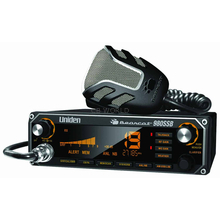 This CB radio includes a mounting bracket with two 5mm thumb screws for mounting. Need replacement knobs? Check out the AUDX2. Looking for a replacement radio bracket? Check out the CB74. Check and calibrate the SWR to ensure your antenna system is properly tuned. 2. Turn Channel Selector to set the channel. 3. Press S/RF/CAL/SWR to CAL. Press and hold the PTT button and rotate the control knob until the bar meter aligns with CAL. 4. Press S/RF/CAL/SWR to SWR. Transmit and note the SWR reading. If the SWR reading is greater than 1.5, adjust the antenna length and recheck. 5. Repeat step 4 until you achieve the best SWR readings.